AKA: why you don’t get your policy positions from internet photo memes. Attention conservation notice: there are no pro-gun or anti-gun stances that can be supported with these cases. However, there are some amazing teachers, coaches, and students out there. Good job, you. I thought ok, well, that’s interesting, let’s take a look at where the graphic came from, which is this site here. Second, within the civilian category two thirds were stopped by unarmed civilians. (emphasis mine). What’s amazing about that is that whether armed or not, when a civilian plays hero it seems to save a lot of lives. I found only one case where the heroic civilian was killed in the process, although many were wounded. He explains his data here. He’s got 28 cases, which is a small sample, but we don’t want him to have more data. Unfortunately, he’s missing some cases–at least one that I notice. There was the shooting at the University of Iowa in his time span. Just missed it? Cherry-picking cases? I don’t know. I’ll use just his cases to look at the same things he did, only with more detail. And we really shouldn’t be using averages with small sample count data–this will be on reason why their difference looks so impressive–the high-fatality adult shooters drive up the average for police interventions. Even with these problems, the comparison is pretty easily explained, and it has little to do with being armed or unarmed, but with the endogeneity problem with severity. Back when I studied such things, fire damage was modeled on an exponential basis: if you have a fire extinguisher, or you and your neighbors could put out a fire in first few minutes, you had far, far less damage than if the firemen had to come in. But you and your neighbors aren’t likely to be able to squelch every type of fire. If you looked just at the correlation between firefighters and damage, you’d assume that civilians were better at fire-fighting because they squelch the small fires and firefighters have to come deal with the big fire. So with shootings, if people are able to subdue the shooter, they probably do, by a variety of means–just like they put out fires when they can, and the “shooters stopped by police” represent cases which have gotten beyond civilian ability to control. Gun proponents will say they are the neighbors with the helpful hoses in case of fire. Once you get into the cases, it’s clear in the record there’s a huge difference between high school shooters (other than Columbine), shooters who are looking for particular targets (like an ex-wife, a hated teacher, or a particular bully)–these appear to be way more likely to be subdued by citizens, both armed and unarmed–and adult, male, and military-trained shooters who are intent upon mass killing, and who are likely only to be subdued or cornered into suicide by police after considerable time has elapsed. The former are the equivalent of small fires, the latter the equivalent of a house fire that has been raging for 10 minutes even with some well-intended hoses from neighbors. Let’s look at his data, with supplements of my own, organized differently: adult shooters versus young adult, inexperienced shooters. So that’s the whole set. Adults are more dangerous, and there are some really bad guys in there pushing up the median in the adult set. What we’ll see is that civilian interventions are way, way more common with high school and young adult shooters, and those intent upon killing particular targets, whereas the police are the only people likely to be able to eventually stop some adult male lunatic wearing body armor and with an AK-47. Number of cases where armed civilians subdued adult shooter: 0, 1, 2, or 3 depending on whether you count off-duty policemen as armed civilians, and what stories you believe about the Appalachia Law School Shootings and the Tyler Courthouse Shootings. 1/16/2002 – Peter Odighizuwa opened fire with a handgun at The Appalachian School in Grundy, Virginia. 3 people were killed before the shooter was apprehended by 3 students, Mikael Gross, Ted Besen, and Tracy Bridges with handguns without firing. Wikipedia tells the story somewhat differently: Besen did not have a gun and Odighizuwa surrendered before the guns showed up and Gross and Bridges showed up with guns later according to one story. The other is that he was subdued by gun users. Not sure what to do with that one. We can code it for the pro-gun side, with the caveat that the guy who appears to have done the tackling was an unarmed former police officer, and Odighizuwa appears to have been one of those shooters who wanted to kill particular people and gave up ground when he did so. So, armed civilian heroes that provide evidence for the pro-gun case? Or shooter who had done what he wanted subdued by an unarmed former police office? I have no idea. 2/25/2005 – David Hernandez Arroyo Sr. opened fire on a public square from the steps of a courthouse in Tyler, Texas. The shooter was armed with an assault rifle and wearing body armor. Mark Wilson fired back with a handgun, hitting the shooter but not penetrating the armor. Mark drew the shooter’s fire, and ultimately drove him off, but was fatally wounded. Mark was the only death in this incident. As Wilson approached Arroyo from behind, Arroyo was taking aim at his son who he had already shot in the leg and wounded. Acting to defend the life of Arroyo’s son, Wilson fired a round from approximately 50 feet which struck Arroyo in the back causing him to stumble and taking his attention away from his son. A witness who saw Wilson’s round strike Arroyo reported seeing “white puffs of powder-like substance” come from Arroyo’s clothing. This is believed to be the first time Arroyo was hit or injured during his attack on the courthouse. Wilson was forced to take cover behind Arroyo’s truck in a prone position and exchanged fire with Arroyo. As Arroyo began to approach Wilson’s position, he stood up from behind cover and fired again, hitting Arroyo. Unknown to Wilson, Arroyo was wearing a bulletproof vest, rendering Wilson’s shots ineffective. Arroyo eventually fired a shot that struck Wilson, who faltered and fell from the view of witnesses, face down behind Arroyo’s truck. Arroyo then walked up to Wilson and fired three more shots at him, killing him. In the end, a police offer shot and killed and Arroyo. Did Wilson help or hinder? Police were already in a shoot-out; they might have been able to be more aggressive if a civilian had not been bent on heroics and inserted himself. But perhaps he did save the child and further fatalities; he was certainly a brave man who sacrificed himself to try to do something good. Who knows such things? Nonetheless, Arroyo also seems to have been one of those shooters who was after particular targets. It’s not clear that he would have tried to take more people with him once he’d been able to shoot his ex and his son, and he fled the scene after shooting Wilson. That doesn’t suggest a shooter who went in intended to kill as many people as possible along with himself. But perhaps he was. 4/22/2012 – Kiarron Parker opened fire in a church parking lot in Aurora, Colorado. The shooter killed 1 person before being shot and killed by a member of the congregation who was carrying concealed. This particular case gets a lot of wind among the gun enthusiasts as proof about how the media never reports on all the shooting rampages prevented by armed civilians. Conveniently omitted from this description: the “congregation member who was carrying concealed” was an off-duty police officer, according to Dan Weigel’s story in Slate. We can count this one on the pro-gun side, but with the asterisk for a ringer as I think it actually belongs in the police category. But it’s not like he had tons of back-up. I’m just not sure what this case proves, if anything: I think lots of people are more than happy to let off-duty police officers carry guns, both for this reason and to be able to protect themselves off-duty from reprisals. So the worst case here was 3 fatalities, with the Appalachia St shootings. 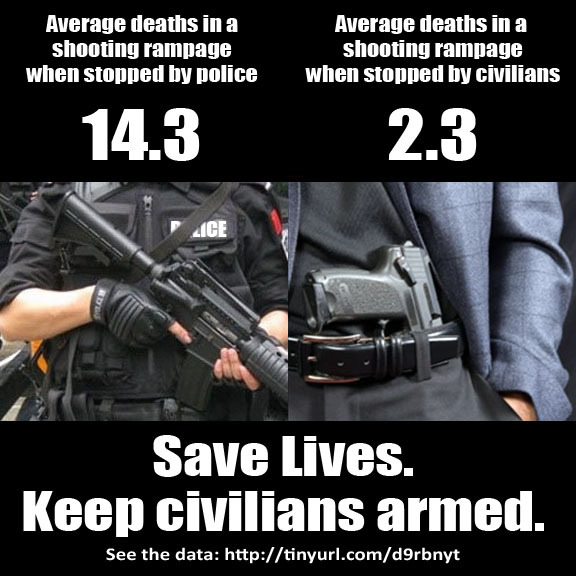 For those who think guns are the answer, that’s going to be proof that armed civilians are effective. I’m not convinced. Cases of unarmed civilian subdues of adults aren’t any more plentiful. There are only two in this set. 2/12/2010 – Amy Bishop went on a shooting rampage in classroom at the University of Alabama in Huntsville, Alabama. She killed 3 people before the Dean of the University, Debra Moriarity pushed the her out of the room and blockaded the door. Does that belong in an argument for armed civilians? Bishop killed three people, as did Odighizuwa. The counterfactual from the gun folks: She would have killed fewer if there had been somebody trained with a gun in the room. Like an off-duty police officer. 🙂 Bishop again strikes me as a shooter who wanted to hit particular targets she believed had wronged her. 1/8/2011 – Jared Lee Loughner is charged with the shooting in Tucson, Arizona that killed 6 people, including Chief U.S. District Court Judge John Roll. He was stopped when he was tackled by two civilians. So I’m thinking that of all of these, Loughner and Parker are the two we have who might have been the straight-up, intent-on-mass killing types. We can’t be sure about Parker, as his bud was nipped by an armed civilian/policeman with 1 fatality. Loughner killed 6 before he was subdued–I can’t believe there wasn’t more security or armed defense at a courthouse. So in roughly comparable cases, you could conclude that armed civilians have in these case had fewer fatalities overall–depending on which counterfactual you construct. But best-case v. worst case, the scenario is 1 fatality v. 6 fatalities, not 14.3 versus 2.3 claimed in the meme. 11/15/1995 – Jamie Rouse used a .22-caliber semi-automatic rifle to fire indiscriminately inside Richland High School in Lynnville, Tennessee. He killed 2 people before being tackled by a football player and a coach. 2/2/1996 – Barry Loukaitis entered Frontier Middle School in Moses Lake, Washington with a rifle and two handguns. He killed 3 people before the Gym teacher, Jon Lane grabbed the rifle and wrestled the gunman to the ground. 12/1/1997 – Michael Carneal brought a pistol, two rifles and two shotguns to his high school in Paducah, Kentucky and opened fire on a small prayer group killing 3 girls. His rampage was halted when he was tackled by another student. 5/21/1998 – Kipland Kinkel entered Thurston High School in Springfield, Oregon with two pistols and a semi-automatic rifle hidden under a trench coat. He opened fire killing 2 students, but while reloading a wounded student named Jacob Ryker tackled him. 9/24/2003 – John Jason McLaughlin brought a .22-caliber pistol to Rocori High School in Cold Spring, Minnesota. He killed 2 people before PE teacher, Mark Johnson confronted him, disarmed him, and held him in the school office for police to arrive. 11/8/2005 – Kenneth Bartley, Jr. brought a .22 caliber pistol to Campbell County Comprehensive High School in Jacksboro, Tennessee and killed 1 person before being disarmed by a teacher. 9/29/2006 – Eric Hainstock brought a .22 caliber revolver and a 20-gauge shotgun into Weston High School in Cazenovia, Wisconson. He killed 1 person before staff and students apprehended him and held him until the police arrived. 2/27/2012 – T.J. Lane entered Chardon High School in Chardon, Ohio with a handgun and started shooting. 3 students died. The shooter was chased out of the building by a teacher and apprehended by police later. That’s 8/11 cases of school shootings where unarmed teachers, coaches, staff, or students shut down a shooter. Again, reading through the cases in more depth on my own, many of these instances seem to be students who may not have been intent upon mass killings, but were targeting bullies, girls who had rejected them, or teachers they thought picked on them. In this set, though, we have multiple instances of teachers without guns doing as well as the off-duty policemen with his gun: 1 or 2 killed in some instances, as many as 3 in others. 10/1/1997 – Luke Woodham put on a trench coat to conceal a hunting rifle and entered Pearl High School in Pearl, Mississippi. He killed 3 students before vice principal Joel Myrick apprehended him with a Colt .45 without firing. 4/24/1998 – Andrew Wurst attended a middle school dance in Edinboro, Pennsylvania intent on killing a bully but shot wildly into the crowd. He killed 1 student. James Strand lived next door. When he heard the shots he ran over with his 12 gauge shotgun and apprehended the gunman without firing. Again. Perhaps the counterfactual is that that students would have killed dozens without the armed intervention. Or perhaps they, like those who submitted to unarmed intervention above, were simply done. 4/20/1999 – Dylan Klebold and Eric Harris were the killers behind the Columbine shooting in Littleton, Colorado. The two both commit suicide after police arrived. (15 dead). 3/21/2005 – Jeff Weise was a student at Red Lake High School in Red Lake, Minnesota. He killed 7 people including a teacher and a security guard. When police cornered him inside the school, he shot and killed himself. Would somebody with a gun have stopped them? Again, who knows these things? In the end, I can’t make these cases tell a consistent story about anything other than human misery, evil, and immense suffering. Many of these shooters flew under the radar of licensing laws, so there’s no clear policy story there, either, just as there is no clear evidence that more guns would have made much of anything better.